India’s largest crowdfunding site. Over $78.4 Million raised. “He keeps saying ‘Appaji, it’s hurting too much please take me home’. I can’t even carry him without causing him unbearable pain. Sitting, walking and even sleeping makes him cry in pain. His stomach has swollen to the size of a football now. He needs treatment before the tumour grows and kills him." Just one month after Prasanna and Hemavathi celebrated the birth of their twin girls, their 2-year-old was diagnosed with cancer. What started as a mild stomach ache quickly escalated to an agonizing pain for Pavan who only pleads for the pain to go away every day. The smile that once lit up their home has been wiped out. 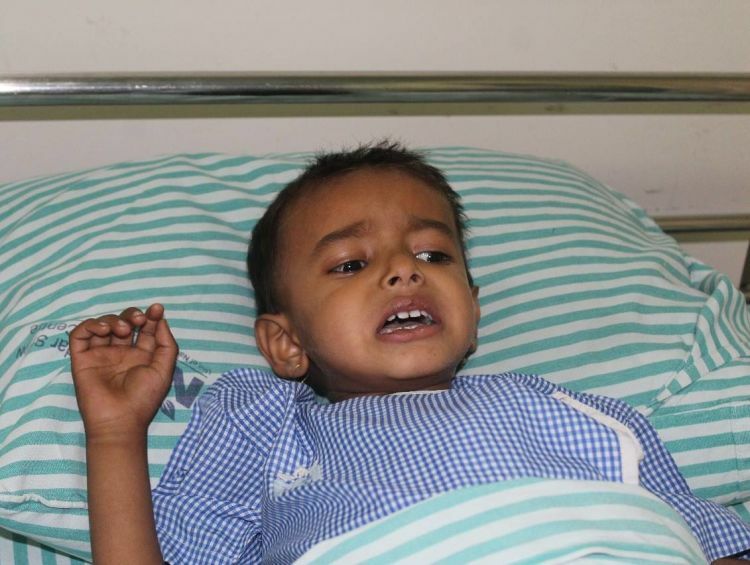 Pavan’s tumour above his left kidney will grow rapidly without a surgery and bone marrow transplant. He has little time without treatment, and miles away from his home and job, Prasanna struggles to find a way to save him. Prasanna can’t carry Pavan for more than two minutes now. His stomach pains so much that he asks him to put him down. Pavan has been in discomfort for 3 months and his suffering seems unending. Pavan has neuroblastoma which is cancer found in the small glands on top of the kidneys. 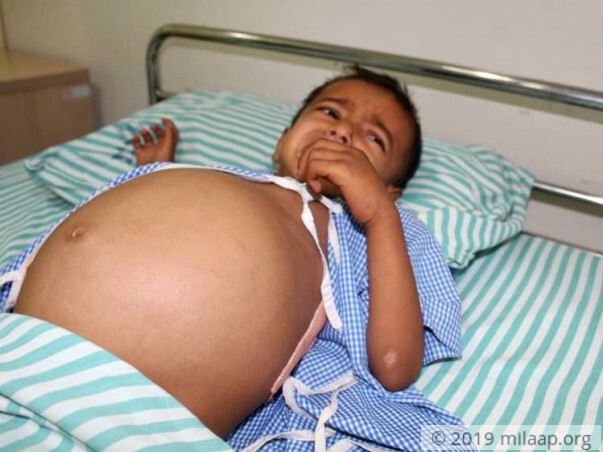 Pavan now needs injections for five days to help reduce the swelling in his stomach, after which, he will need a surgery to remove the growing tumour above his left kidney. Pavan will also need a bone marrow transplant. Pavan’s pain can finally end with timely treatment, but the heavy burden of his medical bills is far more than what Prasanna can carry on his own. Prasanna stays with Pavan in the hospital all day. Ever since his treatment started, his only thought is to save his little boy from the dreadful clutches of cancer. But Prasanna is now running on only a few 100 rupees. He hasn’t gone back to his taxi driver job in 2 months now and the 2 lakhs he had borrowed from friends and family is almost over. He has nothing left to continue his chemotherapy and afford the tumour removal surgery that is so crucial to Pavan’s survival. There’s no escape for Pavan from the pain of cancer without chemotherapy, surgery and a bone marrow transplant. Prasanna, a driver, cannot arrange for Rs. 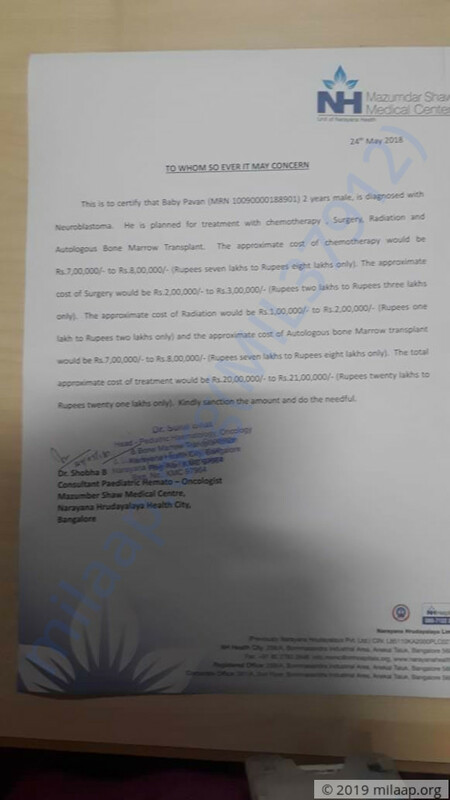 21 lakhs to save his son on his meagre income. 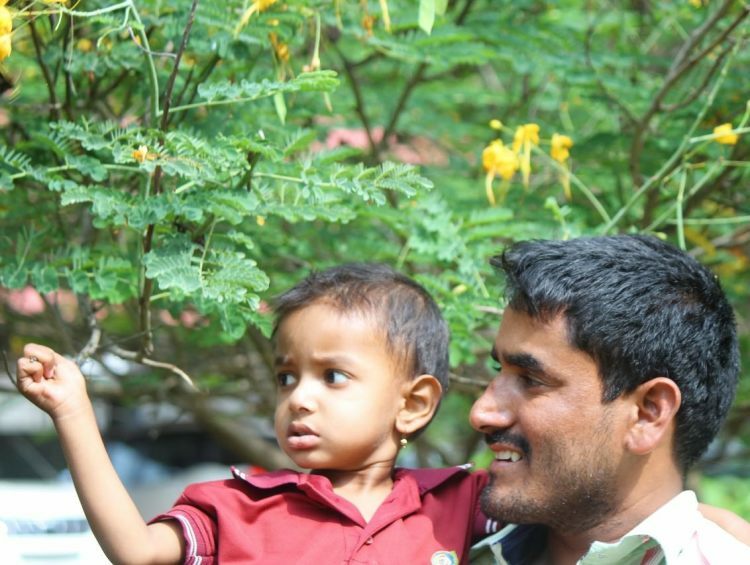 Without treatment, Pavan’s cancer will rapidly spread and he won’t make it. 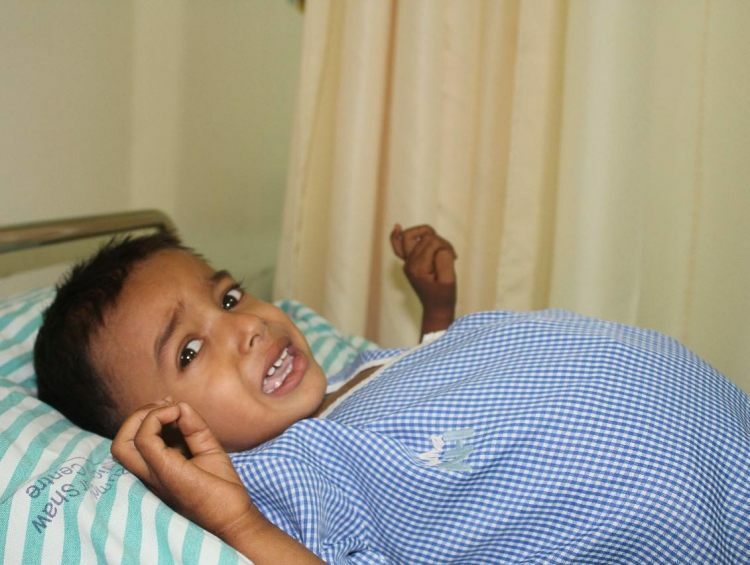 Only timely treatment can give little Pavan a pain-free, healthy life. 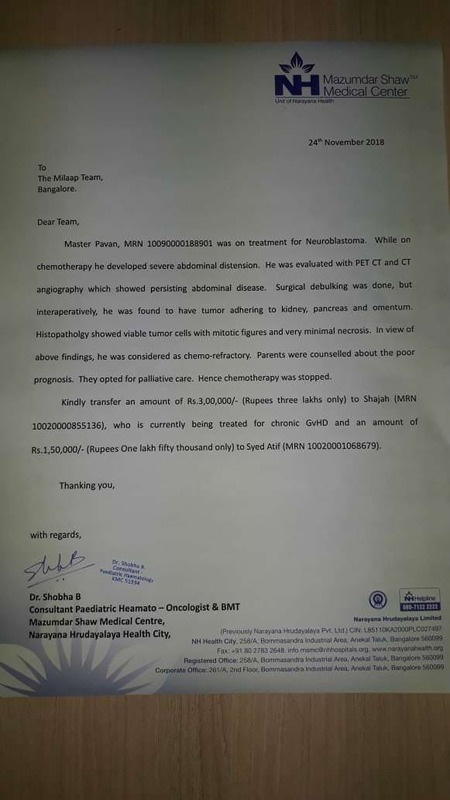 Your contribution can help him beat cancer. Thank you for all the love and blessings showered. The remaining funds post discussion with the family and the hospital will be used two other campaigns which require urgent support so that the patients can undergo the required treatment at the earliest. We would like to map the remaining amount towards these campaigns. 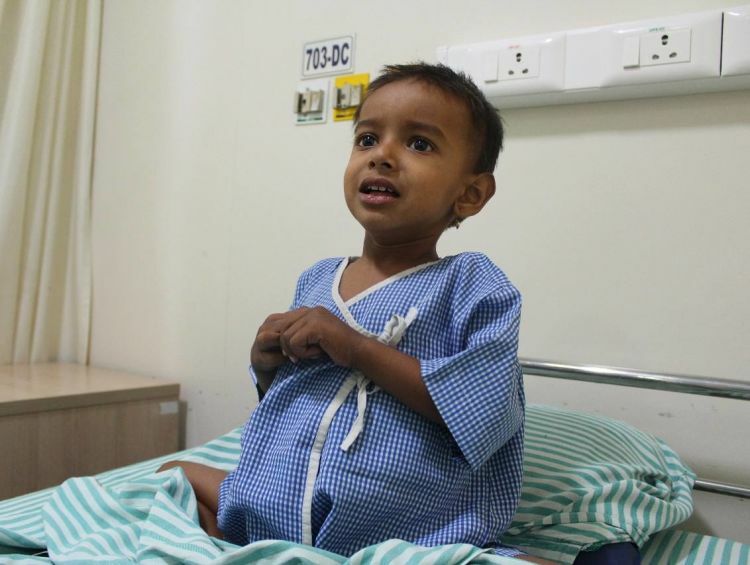 1.https://milaap.org/fundraisers/help-shajah : Shajah’s family needs our support, with our support, this 7-year-old can continue his treatment. This is the only option left with the family. Our support will save little Shajah who has gone through bone marrow transplant. 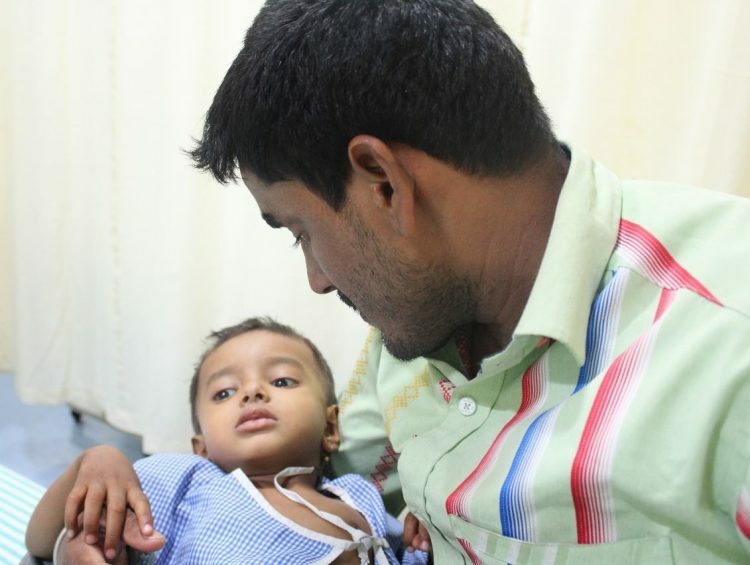 2.https://milaap.org/fundraisers/support-baby-syed-atif : Baby Syed Atif 5 months old Male son of Syed is suffering from a disease. He needs your help to undergo his treatment. Please refer to the above links for any further information and do write back to feedback@milaap.org for any further queries. Thank you for your love and support. Here's a quick update on Pavan. He successfully completed his Chemotherapy and will be undergoing surgery. We are hopeful about his recovery. Please keep supporting. Pavan is currently on a low dose of steroids which will be stopped in a month depending on response. Post this only he can continue with chemotherapy.